We've made it to the final pages of my 1984 sticker book! 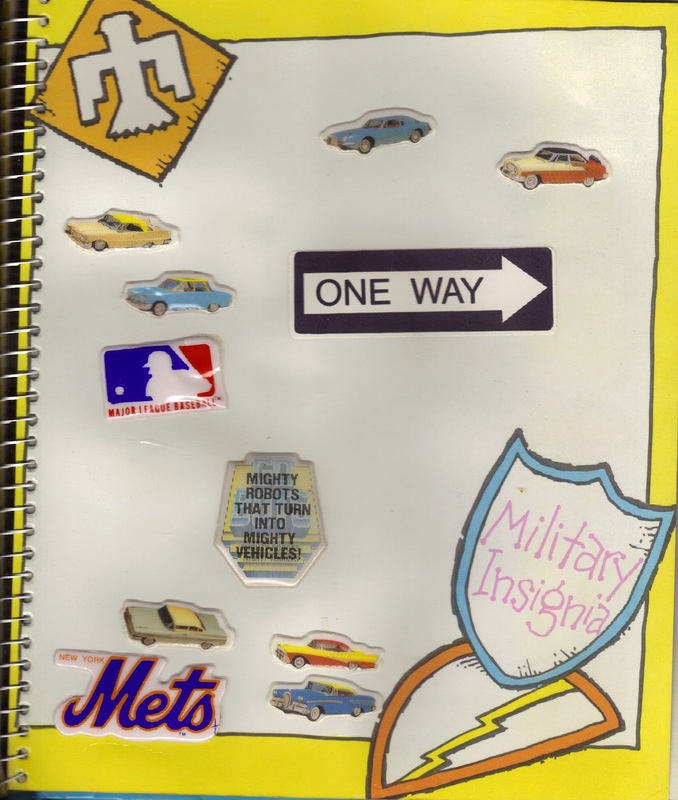 This has been so much fun to share a little piece of my '80s childhood with everyone. 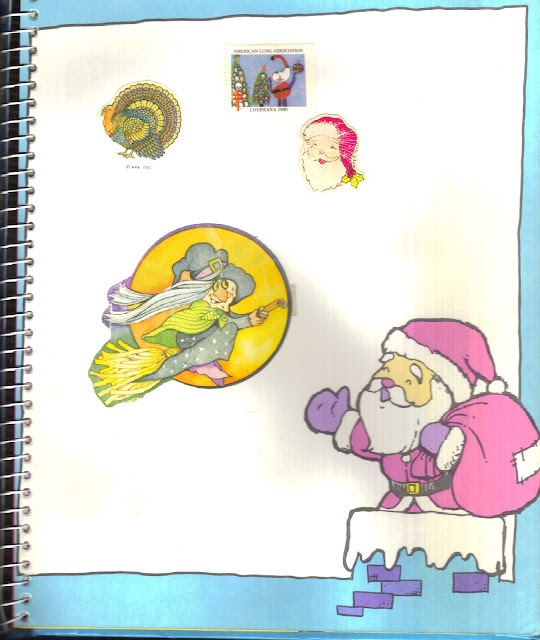 Pages 11-18 gives us a little glimpse of the holidays, a couple wiggly-eyes stickers, some classic cars, and one last page of '80s randomness. And then of course, the answer to the cliffhanger question from part 2...did I break sticker book law and use the inside back cover, even though there was clear warning label??? 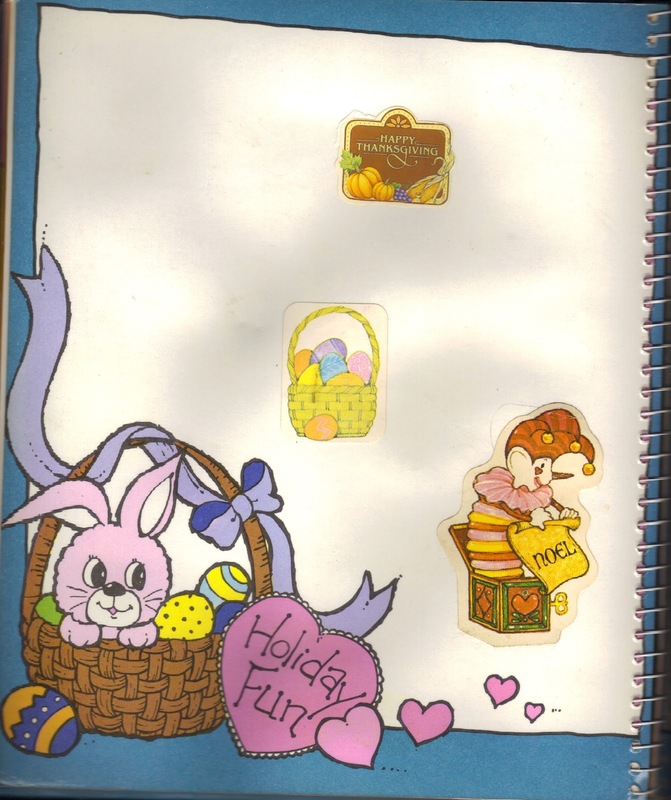 I was very surprised to see these holiday pages almost bare! I'm one of those people that really gets excited around the holidays (especially Christmas) and my showing here is pretty pathetic. At least I did hit four holidays with the seven stickers on these pages. The jack-in-the-box and the witch are the two I remember the most. 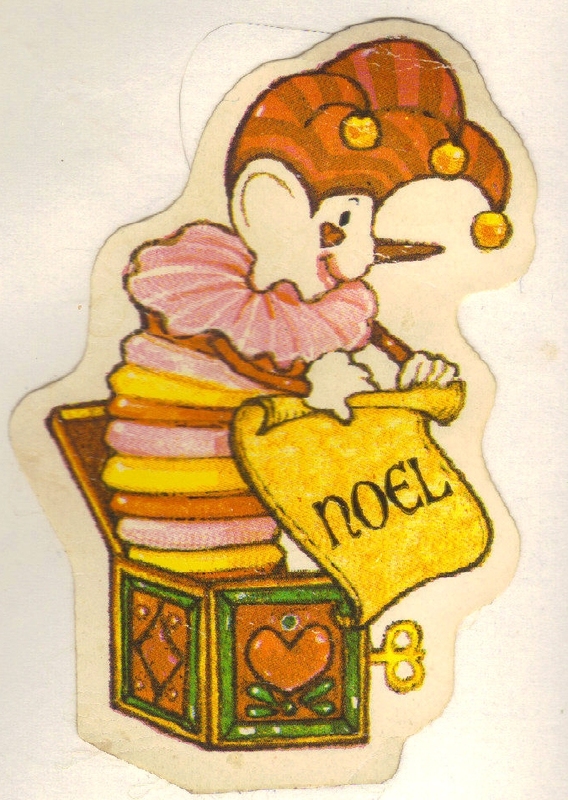 How many of you remember the stamps that used to come in the mail from the charity organizations? Most now send the return address labels, (at least those who still do them.) Back in the day, they were just fake stamps that you had to lick and stick. 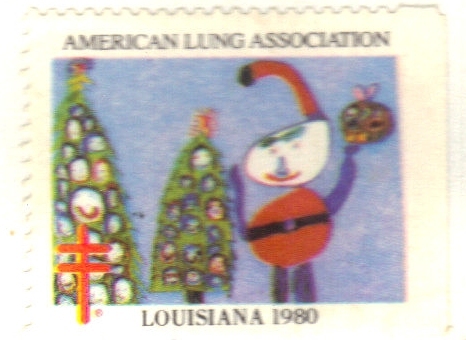 With me putting together this book in 1984, it's funny that this American Lung Association stamp has "1980" on it. I must have swiped it from the Christmas card stash or found it in the back of a junk drawer. I remember in the '80s when wiggle eyes were on practically everything...they had to be, to devote two whole pages of a sticker album to them! Unfortunately, they didn't appear to make much of an impression on me with just having two on these pages. 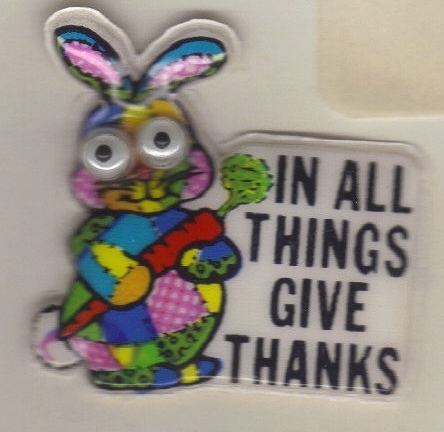 The patch-quilt rabbit made me chuckle. Looking like that and giving thanks in all things...you know that bunny had some self esteem. 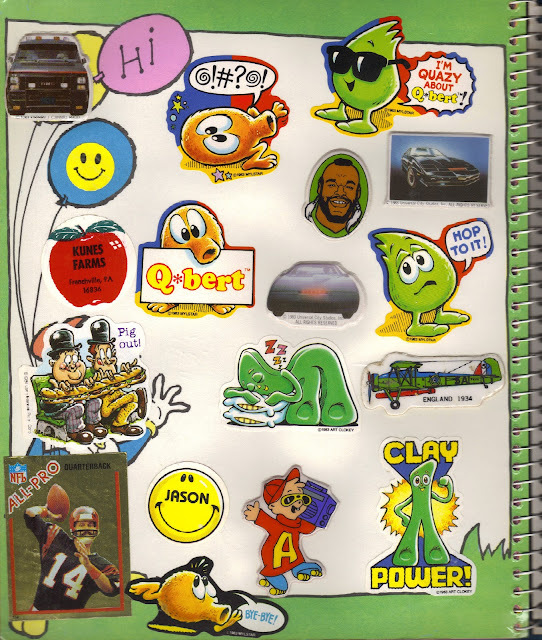 But where I lacked wiggle-eyes stickers, I added more of my favorites. Love the Batman sticker and the GoBots. 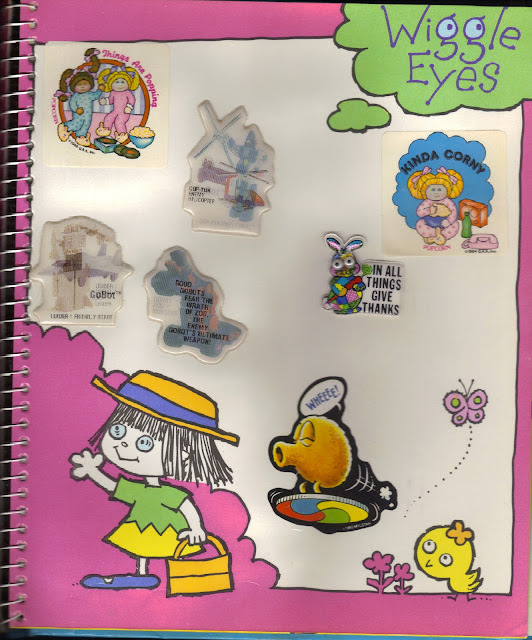 The Cabbage Patch Kids popcorn stickers smelled more like a dusty lampshade though than being at the movie theater. 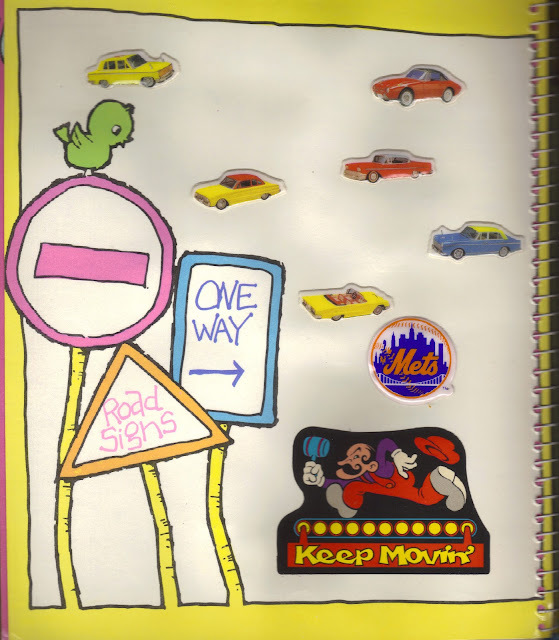 And of course, my pal Q*Bert has always been nearby in this sticker book journey. Well, here they are! 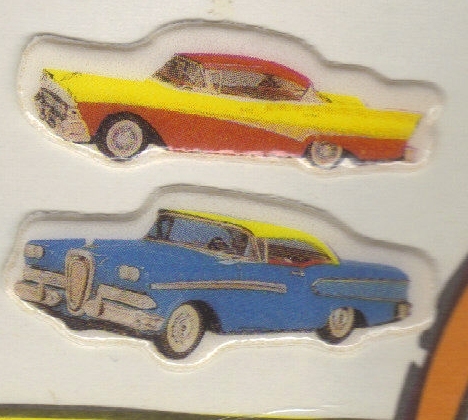 My previously acclaimed "favorite stickers" at the time, classic cars. My dad was (and still is) a huge car buff, so I would venture a guess that he bought me these stickers. Looking at them now, I wonder where were the Corvette stickers? These are nice and all, but if you knew my dad you'd be questioning why these weren't all Corvettes. Still, these are a pretty good scope of all makes in models in the mid-late '50s (from what I can tell.) 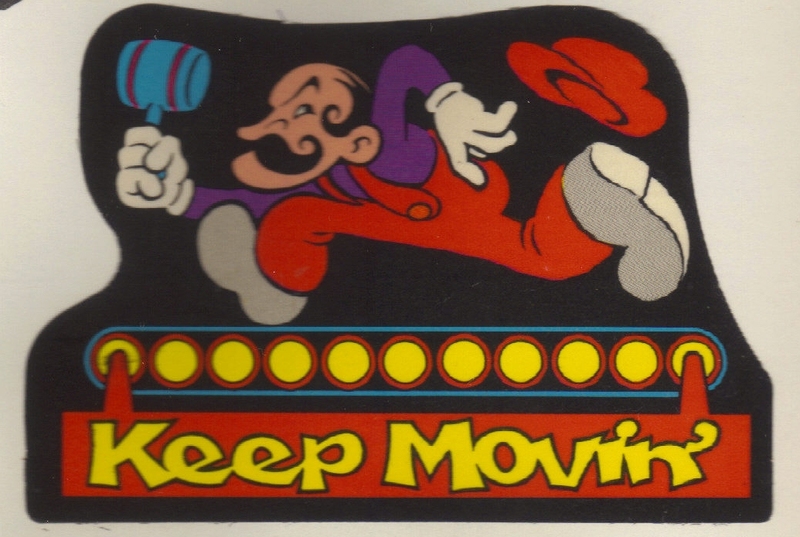 Those amazing Mets are still popping up and a rare look at the original Mario from Donkey Kong. 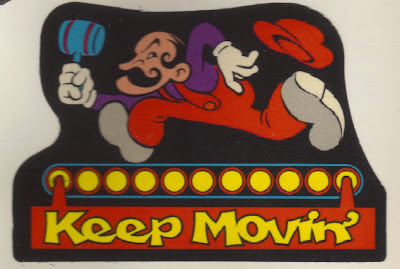 He's probably my favorite sticker in part 3 of my collection. Love this page. It has about one from each set of stickers I had for this book. 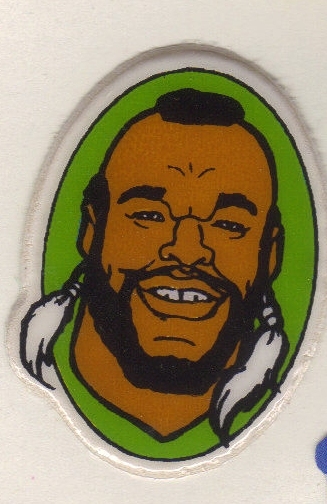 The goofy smile on Mr. T's face is hilarious. It wasn't often he cracked a smile that big on The A-Team or his cartoon! Bengals quarterback Ken Anderson shows that I loved collecting those Panini sports sticker books. I'll take another guess here and say this was a duplicate sticker. I rigorously tried to fill up those stickers books and wouldn't have just stuck this here for the fun of it! 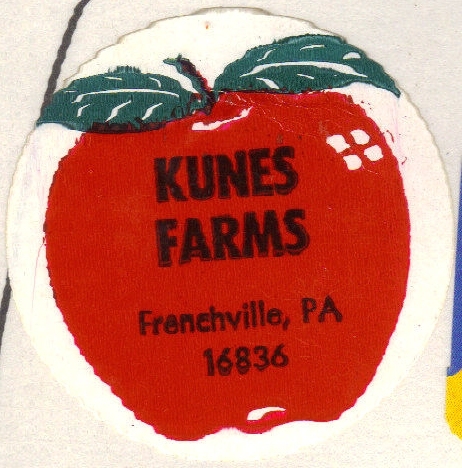 The Kunes Farms sticker (for those of you not from central PA) was mostly likely obtained on a school field trip to this local farm and store. I followed directions up to this point with organizing my stickers according to the page theme...so what did you expect??!! 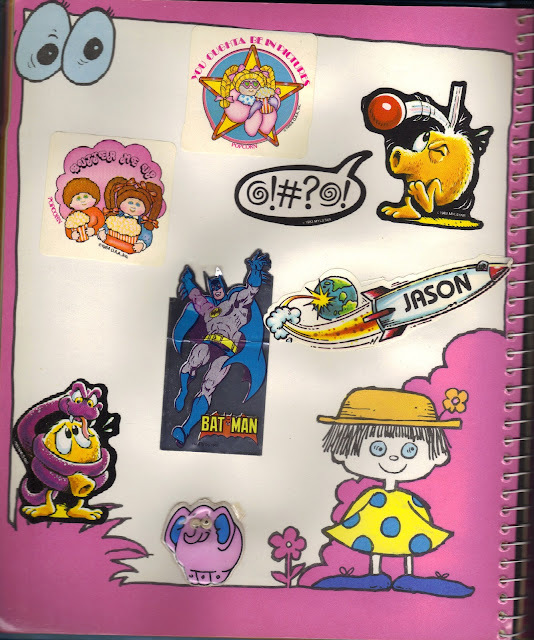 Funny, I don't remember wanting to remove any of the stickers in this book once I stuck them. 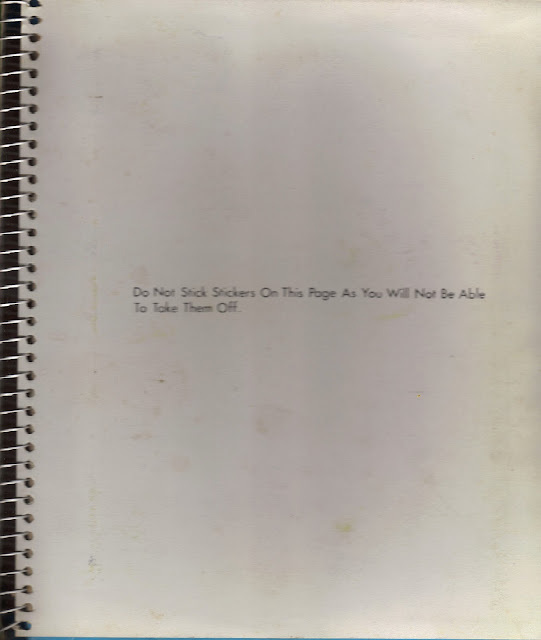 So what was the big deal about sticking them to the back cover...forever! Anyway, I hope you enjoyed this blast from the past as much as I did. Time to track down more memories hidden in my garage and put on display for all to see!